This document was issued in New York to the brig Adolphus, which was under the command of William Brevoort and had a carrying capacity of 156 tons (known as “burden”). The vessel was heading from New York to Bordeaux with a cargo of skins, ashes, cotton and logwood. This sea letter was signed by President James Madison who served two terms from March 4, 1809 until March 4, 1817. Madison was a native Virginian who was educated at the College of New Jersey (Princeton), graduating in 1771. During his distinguished career, he was a member of the Second Continental Congress and sponsored the Bill of Rights while a member of the U.S. House of Representatives. He served as Secretary of State under Thomas Jefferson. Early in his Presidency he responded to the impressment of American seamen and the seizure of their cargoes by the British by asking for and receiving from Congress a declaration of war in 1812. The document is also signed by Secretary of State Robert Smith, an admiralty lawyer in Baltimore. Due to this maritime expertise, President Jefferson appointed Smith as Secretary of the Navy in 1801, a position he occupied until he became Secretary of State under Madison in 1809. Smith was not Madison’s first choice for the position of Secretary of State, and the two did not work well together. Smith’s failed mission to Great Britain contributed to the outbreak of war in 1812. When Madison tried to remove Smith by offering him the post of Minister to Russia, Smith refused and tried to bring down Madison’s administration by publishing an address critical of Madison. Smith’s effort failed and he resigned on April 1, 1811. The document is also signed by Collector of Customs David Gelston, a distinguished merchant and politician. He was very active in New York politics during and after the Revolution, signing the Articles of Association in 1774 even though it would hurt his business. He worked closely with Aaron Burr, and was a delegate to the last session of the Continental Congress. He was appointed Collector of Customs for the Port of New York by Jefferson in 1801 and served for twenty years in that post. 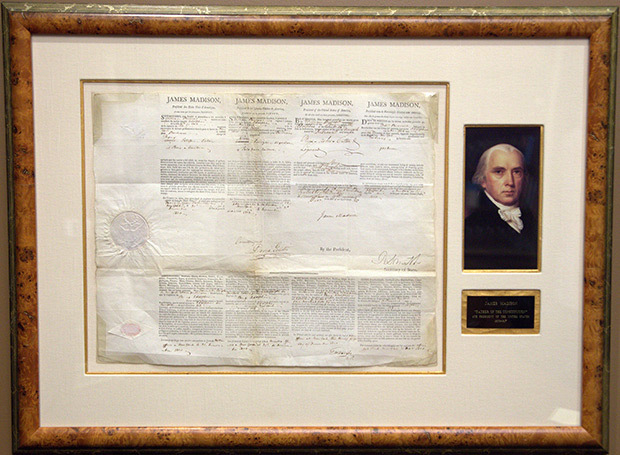 It is also signed by Edward W. Laight as Notary Public. In 1797, Laight’s father wrote to Alexander Hamilton in hopes that Hamilton could become a patron of young Laight who had graduated from Columbia College and had studied law. Within a few months, Edward W. Laight was an Examiner in Chancery, probably due to Hamilton’s influence, and later became Notary. This document is printed on rag paper and bears the Great Seal of the United States on the center left.